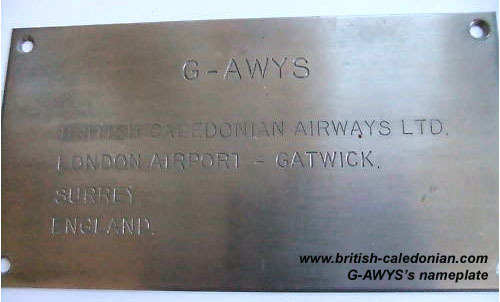 G-AWYS was maintained at London Gatwick and it's Certificate of Maintenance had been renewed on 14th June 1972 and was valid for 110 days or 900 hours; whichever expired first. The aircraft had been fully maintained in accordance with a UK Civil Aviation Authority approved schedule and there were no outstanding defects. The aircraft had flown a total of 8,997 hours and had 5,626 landings since new and had flown 358 hours since its last inspection. 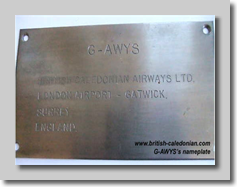 The Crew of G-AWYS were all experienced and had logged thousands of hours on the BAC 1-11. 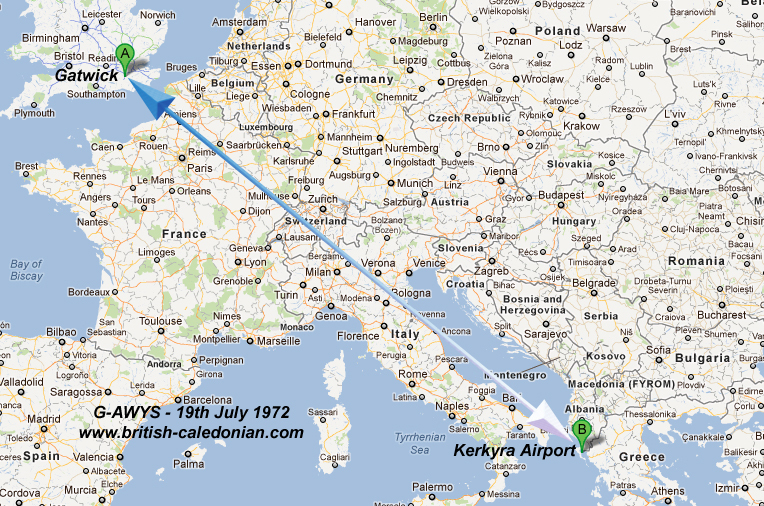 Captain Shilton was undertaking the role a Training Captain and rechecking Captain Mitchell for Kerkyra Airport. During the take-off run and very close to their take-off decision YS ran through the pools of water, though the water caused No 1 engine to surge. Suspecting a problem with No 1 engine the crew aborted take off, but despite performing above expectation YS did not stop within the runway limits. She crossed rough ground and ended up off of the runway in a shallow lagoon; though upright and with her undercarriage intact. All passengers and crew were safley evacuated, but sadly an elderly passenger passed away enoute to the local hopsital, she suffered a heart attack. 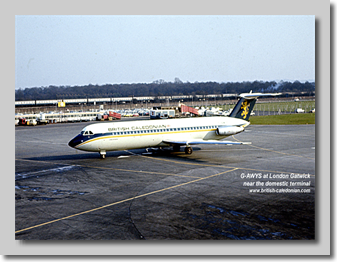 British United Airways were the launch customer for the BAC 1-11 and G-ASJJ was handed over at Gatwick on 6th April 1965. 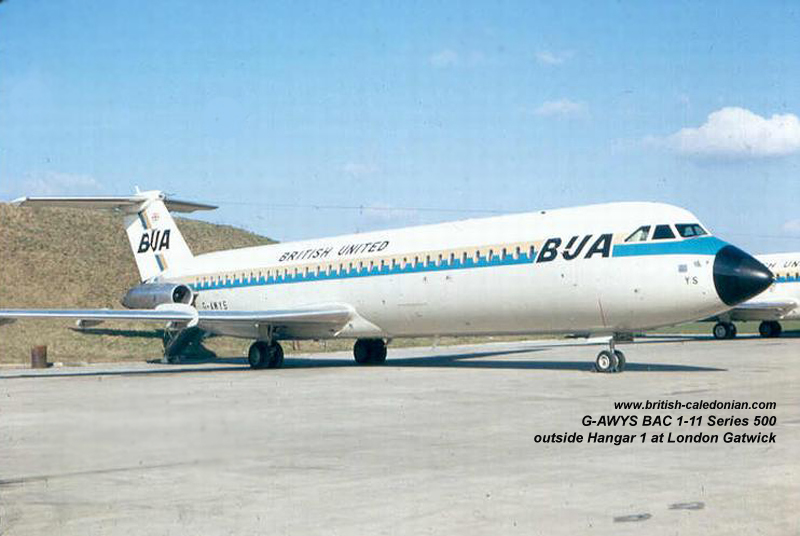 The series 200 1-11's were soon flying scheduled services around Europe as more came into service. 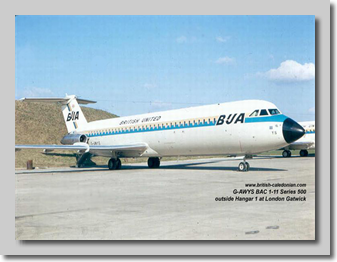 On 4th March 1968 BUA ordered five BAC 1-11 Series 500 aircraft, a £9 million order at the time. These would be G-AWYR, AWYS, AWYT, AWYU and AWYV. 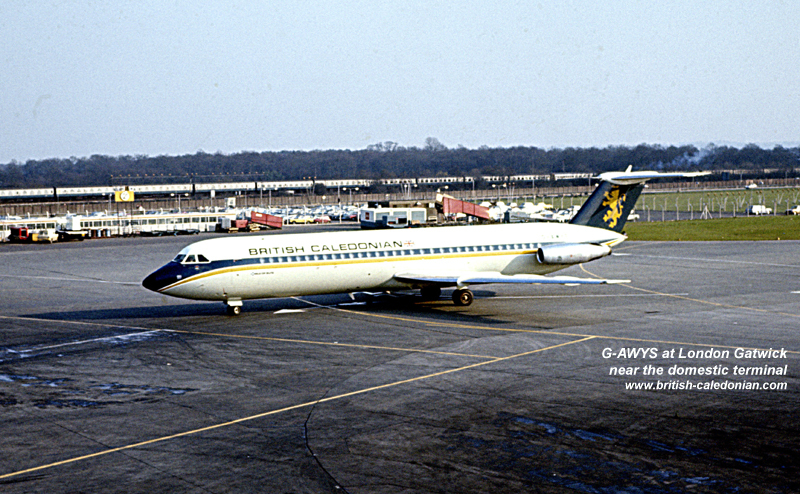 G-AWYS arrived late in April 1969 and was straight into service for the busy summer season flying inclusive tour charters for Horizon Holidays. 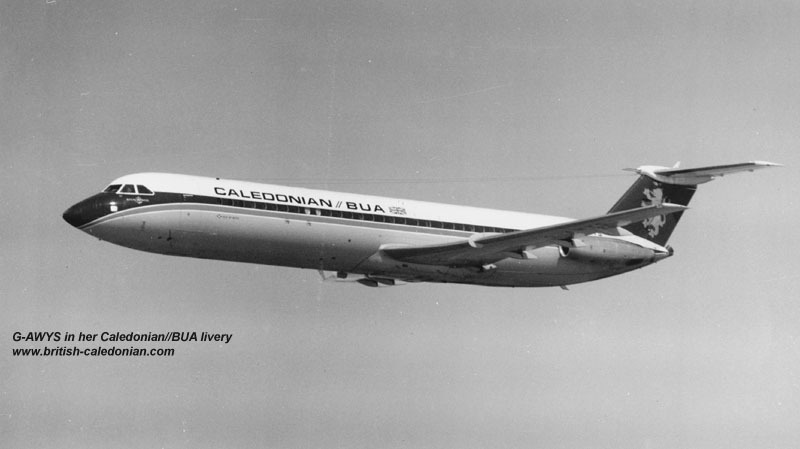 Horizon had been a regular customer from the mid 1950's when Transair flew charters for them and they continued to place regular contracts with BUA and then BCal until 1974; when Horizon Holidays went into receivership. The outbound service had flown from LGW that morning with passengers heading to Greece and had arrived without incident at 11:58 hours (GMT). The flight time was around 2 hours 30 minutes for the 1236 mile flight. 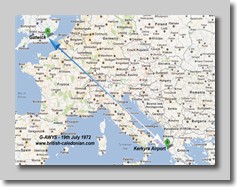 The crew made preparations for the return service, a flightplan direct to Gatwick was filed, with 79 passengers who had finished their holidays. A crew of six were on board. 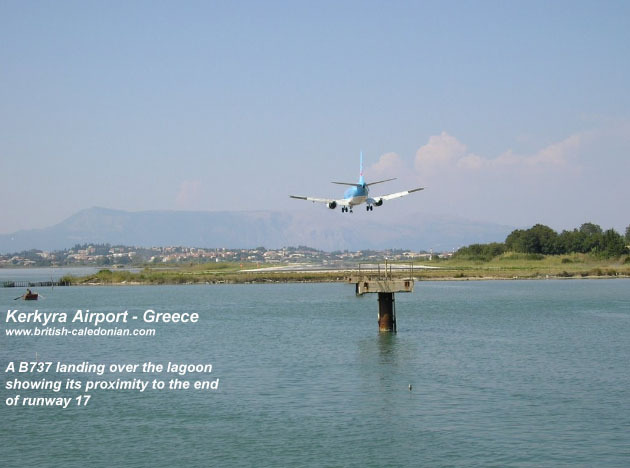 It was a warm day in Corfu, 24Celsius was reported though the runway was reported as wet with pools of standing water midway along it's length from earlier rain. ATC gave take-off permission to Yankee Sierra and their take-off roll commenced shortly after 13:14 hours. 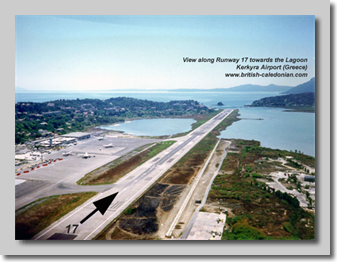 Runway 17 had a rolled asphalt, smmoth, surface that was about 10cm thick. 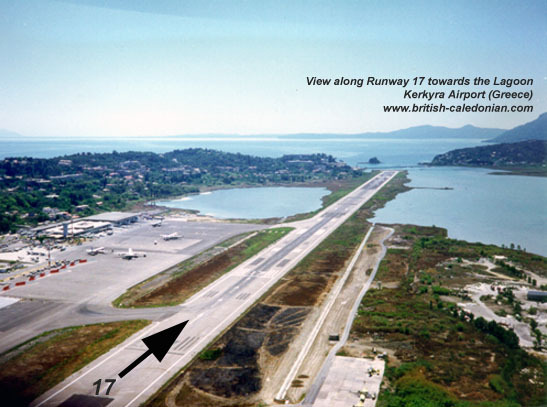 At the time the runway had been partially resurfaced (first 960m), the remaining length had last been done in 1966. Around 600m was reported as heavily contaminated with tyre rubber from landing aircaft. The runway had a slight up gradient and this caused two depressions at its midpoint that sat astride the centre line and were 2 - 3 centimetres deep. The runway drainage was seen to be inneffective as it did not drain this standing water away, despite a crossfall. The only means of clearing this standing water was sun and the passage of aircraft. 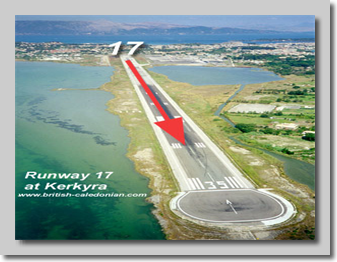 The runway protrudes into a shallow lagoon when 17 is used. 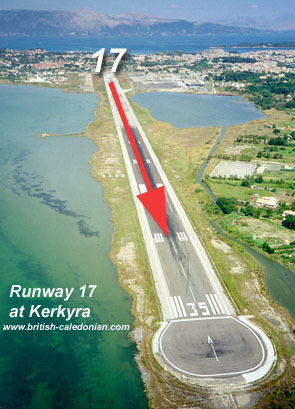 Below a series of photos that show the layout of Kerkyra and proximity of the runway to the lagoon. The first part of the take off run was normal, but with a slight bumpiness due to the runway surface irregularities. Before reaching 80 knots the engine igniters were switched on by the co-pilot. 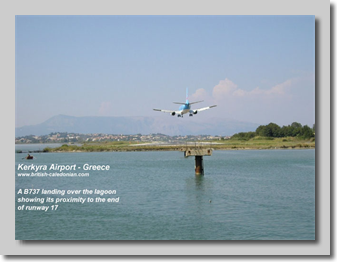 Shortly afterwards and at a speed of 100-110 knots the aircraft ran through the pools of standing water and it seemed to hesitate, then recover. Around the time Captain Mitchell and Captain Shilton were both aware that the aircraft was deviating progressively to the left and Captain Mitchell was having to increase right rudder. Captain Mitchell noticed that No 1 engine's exhaust gas temperature was below the normal and Captain Shilton recalls hearing a double bang from the left hand engine while seeing of the engine's instruments falling too. Captain Mitchell called "Abandon" and closed the engine throttles and applied the foot brakes. 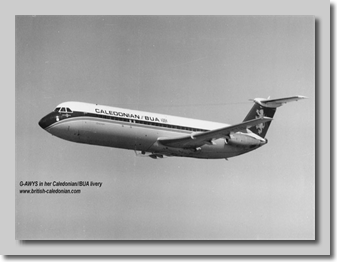 Captain Shilton selected full spoiler and full reverse power on both thrust levers, though initially the aircraft seemed to still accelerate until the speed started to fall off as braking and reverse thrust started to overcome momentum. As the aircraft speed fell to 60 knots it became apparent to Captain Mitchell that there was insufficient runway length remaining to bring her to a stop. Captain Shilton recalled hearing the engine or engines roaring in reverse thrust and on checking instruments saw that the right engine was showing 101%, but he did not notice [or expect to see] any indication on the left engine. Captain Shilton applied full foot brakes to confirm that they were already in use.